The Schley Creek fire remains relatively inactive at 88 acres, according to the Confederated Salish and Kootenai Tribes Division of Fire. Three fires are burning on the Flathead Reservation. The Mollman Fire was active Monday and Tuesday. The fire picked up about 2 p.m. both days and actively burned. Fire spread is low to moderate since the majority of the fire is trying to work its way through the grass that was burned in 2003. One hot spot is in the timber on the main ridge that is about even with the top of the old fire scar. This has potential to establish in the timber and continue a slow spread down slope. It was helicopter-traversed on Tuesday at 88 acres. Whitehorse Lake was active Tuesday due to a drier atmosphere. At close to 2 p.m., smoke began to stand up more and was affected by the southwest wind. As with the West Garcon Fire in August, the wind had significant influence by pushing down-slope and moving the fire downhill with down slope spotting. It is now 330 acres and is affecting Whitehorse Lake, Marmot Lake, Neil Charlo Slough and Floyd Lake. The road to Floyd Lake remains closed at the Louie Lake junction. 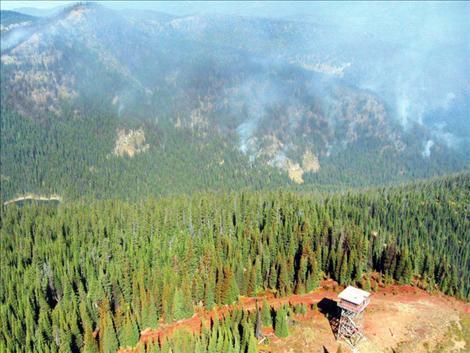 Schley Creek Fire was relatively inactive with minor burning in some of the unburned fuel islands on the north aspect. It remains at 65 acres.